As we get older, everything around us changes. You may downsize your home for a more convenient lifestyle. Your social circle may change as friends and family members relocate or pass on. Even your body can just feel older, too, limiting your activities and everyday mobility. But, in the midst of all these major changes that come with getting older, why not make some changes for the good, and get a little stronger and live a little longer in the process? 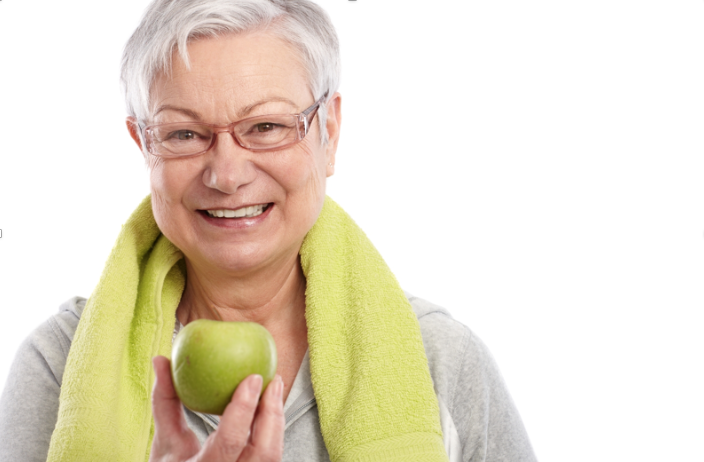 Remaining healthy and independent as you age is important. As the old saying goes, “You’re only as old as your feel.” For you, you might feel pretty old! But, taking control of your health may be easier than you may think. Paying close attention to your diet and nutrition is one simple way to add some life to your years. As always, for your health and safety, be sure to consult with your physician or a professional dietary nutritionist about any changes to your diet before you make them. Stay hydrated. As you get older, you may not tend to feel as thirsty throughout the day as compared to years passed. And, if you don’t feel thirsty, you probably don’t think about drinking a glass of water. But, your body still needs plenty of fluids to stay healthy. On average, you should be drinking 6-8 glasses of water per day. Lack of sufficient water intake can contribute to confusion, and is one of the leading causes of daytime fatigue. Drinking the proper amount of water can reduce headaches, and prevent illnesses like infections and constipation. Limit your sodium intake. If you are like many senior citizens, you may suffer from high blood pressure (hypertension), something common among older adults. Try to minimize your sodium intake by avoiding frozen dinners, processed meals, and many restaurant foods. These tend to be high in sodium, and bad for you. One simple tip: eat plenty of fruits and vegetables every day, and you should keep your sodium consumption at a safe level. Watch your calorie intake. Don’t skip your meals. You may not seem very hungry throughout the day, but don’t replace your lunch with a cup of coffee and a yogurt. Believe it or not, even though you’re getting older, your body still needs a significant number of calories to sustain itself. If you’re a woman over 50, depending on your daily activity, you should be receiving between 1600-2000 calories each day. If you are a man over the age of 50, your daily caloric intake should remain between 2000-2800 calories. Eat the “Rainbow” of nutrients in your diet. Talk to a nutritionist about the best ways to keep vitamins, minerals, and other nutrients in your diet regularly. One simple trick is to fill your plate with at least 5 colors of the rainbow with every meal. Color-rich fruits, vegetables, proteins, grains, and dairy products are filled with Omega-3 fatty acids, Calcium, Vitamin D, fiber, and other minerals needed to stay healthy as you age. The proper nutrients are needed to improve heart health, increase bone density, maintain a healthy weight, and reduce your chance for heart disease and other diseases. Adjust your dietary changes slowly. Change can be a tough thing. Maybe, you’ve gone to breakfast with your neighbor at the same restaurant every day for five years. Maybe, you and your wife have sat down with your microwave dinners every night at the same time since you retired in order to watch your favorite show together. Start out slowly, making only a few simple changes on a semi-regular basis, and increase your number of days of change gradually. Pretty soon, your graduated changes will slowly become the new normal for you. This will also allow you and your doctor to monitor whether or not any medications you may be taking would react with your changing diet. Growing older is inevitable. But, your first steps toward a healthier, stronger you can be made on your next trip to the grocery store. Eating the right foods can help you live each day ahead of you to the absolute fullest.